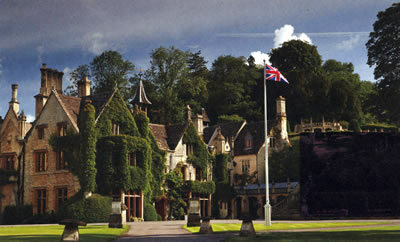 Castle Combe is a charming village not far from Bath. When I arrived in the Royce, I had a tingle of déjà vu. The stone cottages and the 15th Century tower of the church seemed familiar. And probably they were, for the prettiness of the place has frequently attracted the directors of films and the makers of television programmes. 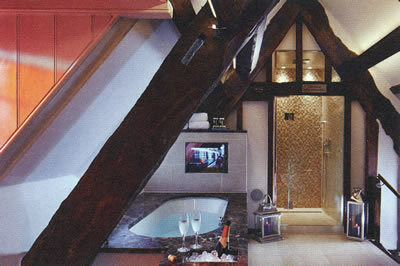 Since 1947 the village’s manor house has been a widely admired hotel. With its origins in the 14th Century, its setting within spacious grounds and the picturesque disposition of its stonework, there is, indeed, much to stir our admiration about The Manor House. As I entered by the front door, I noticed the beams, the fireplaces and the antique furniture which seemed so right for this place. I also noticed something else, for which I murmured a heartfelt Deo gratias! – no canned music. I was soon in the care of the members of staff, whose youthful enthusiasm does credit to the hotel’s General Manager, Stephen Browning. They saw me safely installed in my billet and the Royce safely installed in the discreetly placed car park. Some of the 48 rooms are in a terrace of cottages within the grounds, but my own apartment was a Junior Suite in the main house (£260 - £315 a night, bed and breakfast for two, according to season), called ‘Crews Croft’. This was on the first floor – note that there are no lifts – at the front of the building. I therefore had a lovely view of the fountain and the croquet lawn, with the greenery stretching towards the mature trees in the distance. All was quiet, calm and soothing. It sounds quintessentially English. And it was quintessentially English. Off my little entrance hall was a small walk-in wardrobe, with a private safe. The bed-sitting room had a beamed ceiling and two casement windows, through which I could admire my English panorama. 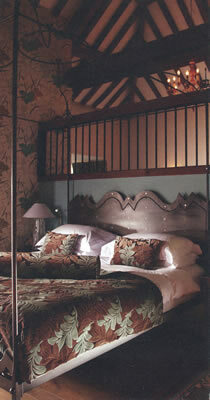 There was plenty of space for two armchairs and a few pieces of antique furniture, as well as for the comfortable bed. Its colour scheme was one of off-white (the wallpaper) and grey (the carpet), enlivened by touches of purple. Appropriately for a building of such age, there was a stone fireplace. The bathroom was a chamber of pristine white, with two wash basins and a bath tub of decent size. The shower and loo were in a separate room. This was pleasant and comfortable accommodation. Once settled in, I set out to explore the property. I liked particularly the plethora of sitting rooms. Each invited me seductively for a pot of tea and some cucumber sandwiches, but – stern Puritan that I am – I forsook such indulgence and determined to find the famous Italian garden. It did not take much finding, but it did take some effort, for it is up many steps outside, to the left of the main door. Still, you should persevere, for it is a remarkable ensemble. Tired from these exertions, I rested before dressing for dinner, and thought what a privilege it was to be able to close one’s eyes to the sound of birdsong, with the sun’s rays streaming through the windows. Then, bathed and be-suited, I set off for The Bybrook Restaurant on the ground floor. The hotel dining room is in a sympathetic addition at the rear of the building. It is large, with widely spaced tables, oil portraits on the walls and two crystal chandeliers hanging from the ceiling. Clearly, attention has been paid to the necessary accoutrements: the napery is white, the crockery is by Villeroy & Boch and the glassware is by Riedel (the Restaurant range). Members of staff wear black waistcoats and black aprons. As I settled myself at a large round table, my expectations were high. Executive Chef Richard Davies worked at The Vineyard at Stockcross and with Gordon Ramsay in Chelsea before coming here in 2007. He now has a Michelin star, and fully deserves it. I found his cuisine appealing. Fine ingredients are handled with skill, combined with intelligence and presented with aesthetic flair. 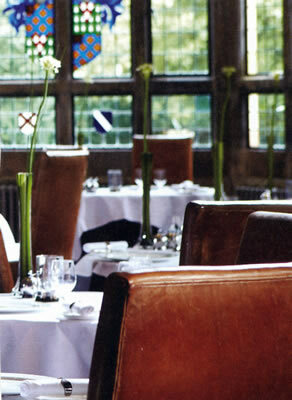 He offers a 7 course tasting menu for £74, or three courses from the carte for £62. I chose the latter. Before my first course came an amuse-bouche of really tasty pea soup. Then I was delighted with a confection both subtle and sumptuous, with a splendid combination of textures: a slow cooked duck egg, with pickled shimeji mushrooms, foie gras, celeriac velouté and pancetta. The venison (which attracted a £5 supplement) was just as good, with superb meat well served by its accompaniments: slow cooked fillet, with truffled mashed potato, parmesan, butternut squash and red wine jus. My pudding showed there was flair in the patisserie department, too. The warm hazelnut cake, the milk chocolate cigar and the banana ice cream were each delicious, and together they constituted a triumph. The wine list has 278 offerings from the New and Old Worlds, and includes 6 magnums and 14 halves. 14 wines are offered by the glass. Bottle prices run from £31 for a 2013 Spanish red from Catalunya to £1,100 for the 1985 vintage of Cheval Blanc. Those two ever-reliable whites are here: the Cloudy Bay chardonnay from New Zealand (2010) for £75 and Antinori’s Cervaro della Sala from Umbria (2011) for £100. From the Lebanon comes the 2010 Chateau Musar (keenly priced at £40) and among the super-Tuscans is the 1999 Solaia (£370). I always count the presence of German sweet wine as a sign of a good list and here there is a riesling eiswein from the Rheingau (Johannishof, 1996, 500ml - £322). From France there are some real temptations, among them 2004 Corton Charlemagne, Pierre André (£230), 1990 Mouton-Rothschild (£950), 2000 Cos d’Estournel (£300) and 1998 Margaux (£1,000). I drove away in the Royce full of gratitude to this admirable hotel. 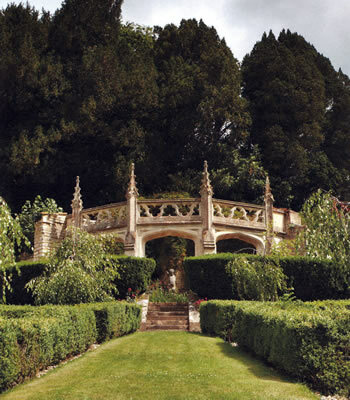 For rest and refreshment and a glimpse of that idyllic England we all carry within our national consciousness, The Manor House at Castle Combe probably cannot be bettered. Castle Combe, near Bath, Wiltshire SN14 7HR, England.